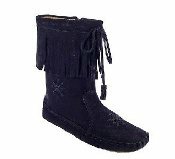 Women's Peace-Mocs Ankle-Hi Fringe Boot with lightweight rubber sole, Fully Lined, Inside Zipper for comfort, and padded insole. Made with soft, supple suede. Indoor/outdoor use.